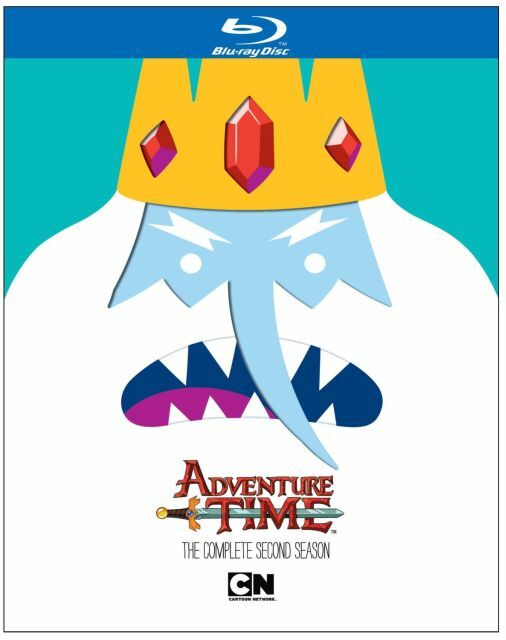 The first two seasons of Adventure Time are here on Blu-ray. If you've never seen Adventure Time, it's... one odd cartoon. I mean, the very first words spoken by Princess Bubblegum at the beginning of the first episode are "Let me just add three more drops of explosive diarrhea... ", so that should give you some idea. I had caught a few episodes on Cartoon Network but never really got into it like The Amazing World of Gumball or Regular Show. It wasn't until binge watching the first two seasons on Blu-ray that I came to really appreciate the show. Now I have yet another cartoon on my TiVo's season pass! 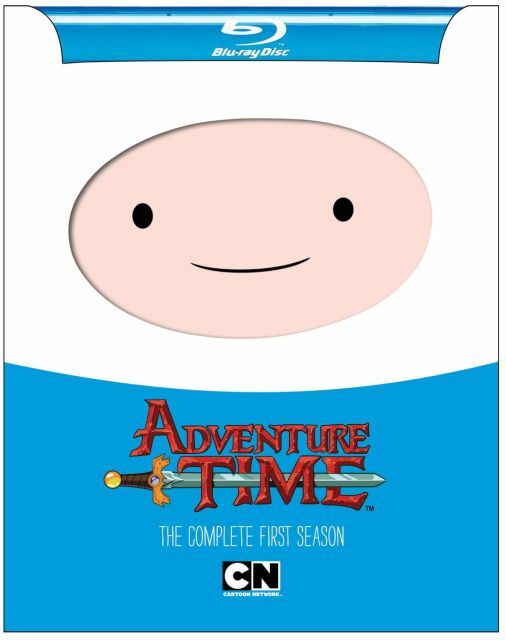 Adventure Time follows the adventures of 12-year old Finn the Human and his best friend Jake the Dog (voiced by John DiMaggia, Bender from Futurama) through the magical land of OOO. Jake isn't just a regular dog though, as he can stretch and reform into almost any size or shape he wants. This would make it super easy to get out of several situations Finn and Jake find themselves in, but it seems this ability must slip their minds at most such times. Not exactly logical, but you shouldn't be coming into this show expecting any kind of logic. Just embrace the silliness for what it is and enjoy. This world is filled other odd characters, such as Princess Bubblegum (voiced by Hynden Walch, aka Starfire in Teen Titans), the evil Ice King (voiced by SpongeBob himself, Tom Kenny), Marceline the Vampire Queen (voiced by Olivia Olson, who is also the voice of Vanessa Doofenshmirtz in Phineas and Ferb), a tiny yellow-green elephant with a southern drawl accent called Tree Trunks, and one of my favorite characters a floating lumpy blob called Lumpy Space Princess (voiced by series creator Pendleton Ward). The plots aren't nail-biters and there's no real story arc to speak of, so the entertainment all comes from the characters themselves. It may take some time to get used to, but I recommend giving it a chance. The episodes are all like eleven and a half minutes long which allows the silliness and weirdness to move on so they don't wear out their welcome. New adventures are always just around the corner! The art is pretty simple, but they absolutely get the emotions of the characters through so it works, and they use some really nice color palette which make things pop. And in high-definition on Blu-ray it looks fantastic. Each of the two seasons contains 26 episodes plus extras. The first season only has a handful of audio commentaries while the second season contains audio commentaries for every episode. The few on the first season are definitely more interesting than the ones on the second season; the commentaries for the second season don't have any of the voice actors and were edited for content, so that was a bit disappointing. The first season also has a few featurettes, a Behind-the-Scenes... and a Behind-the-Scenes of the Behind-the-Scenes featurette, and a featurette about the music editing. The second season contains "The Crew of Adventure Time, Interviewed by Pendleton Ward", which is easily skipped. Trust me, you won't miss anything by not watching that. What else? Season one had a music video... and animatics which never seemed to end. Do people really find animatics that interesting? Oh, then there was a short called "The Wand" which wasn't bad. It's only like a couple minutes long though. Alright, so I'll admit that this show won't be for everyone, but if you have any kind of fondness for those crazy cartoons shows found on Cartoon Network then I'd definitely recommend giving this show a chance. Once you get to know these characters and the utter oddness of the world and its inhabitants, it becomes easy to just relax, turn off your brain, and enjoy the show for what it is. Oh, and the last line of the first episode... "Don't squeeze me or I'll fart!"